A woodworker’s shop wouldn’t be complete without woodworking power tools. While not everyone can afford the very best tools available, it’s a little easier to purchase some of the better quality tools when you buy them one at a time. In addition, as your knowledge and skills increase, you can increase the number of woodworking power tools that you have. 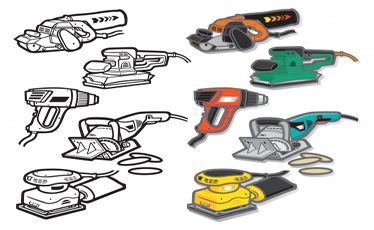 Here are seven power tools that every woodworker would like to have. Links to very competetive suppliers are at the bottom of this page. Click on the following headline links to view a variety at Amazon or the highlighted words or graphic links for my favourite woodworking power tools. One of the most versatile yet basic power tool is the circular saw. For an experienced woodworker, it can become a suitable substitute for several other tools. It does take a bit of practice to become efficient with a circular saw, but once you have the hang of it, you’ll quickly realize its worth. This is one of the first woodworking power tools that you add to your shop. You will find my selection of circulars by clicking Circular Saws then scrolling down the page. Cordless drills are convenient and very popular, most now having a 1/2hour charge and often supplied with 2 batteries. I'm currently using a DeWalt 18v but I interchange this with a Bosch. I use corded drills when I need more power , such as drilling into concrete or a dense stock brick. They aren’t as versatile as the cordless which drill, screw, hammer and have torque settings but they have the drilling power for heavy drilling tasks. You want one that will let you drill at a slow RPM up to a high top speed. Spend your money on a good quality, well-warranted 3/8 inch corded drill and an 18v cordless drill. I recommend 18v because they do not become too heavy over long periods whilst their power is sufficient to complete most tasks. This power tool allows you to cut those difficult circular and curved patterns. I have had two in 40 years, the first was stolen. I most always use rough wood blades, cutting from the underside if I don’t want spelches on the face side, but I wouldn’t recommend anyone without vast experience to try this. 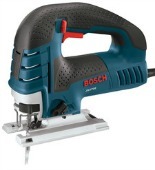 Bosch are the masters of Jigsaws and I have no hesitation in recommending the Bosch JS470E 7.0 Amp Top-Handle Jig Saw available at $149.99. 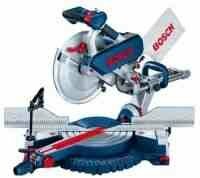 In my opinion Bosch made this saw perfect from the 'off'. The design is the same as 30years ago when my employers first bought 2 dozen for all their boat builders. No doubt since then they have improved further with new technology. Another very important tool is the random orbital sander. Palm sanders don’t cost as much, but the random motion of the random orbital sander helps to reduce the sanding marks on your stock. Usually a selection of sanding papers of various grits are included with the purchase. The first major tool purchase you will make will probably be the table saw. It’s probably the most important tool you will own and it is certainly the heart of any woodworking shop. Research the models ahead of time and try to buy the best model you can afford. You’ll really appreciate it as you become more experienced. I have now sold my workshop to concentrate on this website but should I have had need to replace my table saw the Sawstop CNS175-SFA30 1-3/4 HP Contractor Saw with 30-Inch Aluminum Extrusion Fence and Rail Kit would be my choice. Should you do contracting and require a portable then the Bosch 4100DG-09 10-in Worksite Table Saw with Digital Rip Fence and Gravity-Rise Wheeled Stand can be wheeled onto site . This saw might not cost as much as your table saw, but it’s an invaluable asset to any shop. A compound miter saw is used for cutting and creating compound angles on the end of stock and once you’re used to handling it, your sliding bevel and panel/tenon saw will see less work. There are models which cut angles both ways and some which slide to cut larger widths. I used this as my major tool when building 56 luxury flats. It cut fire door casings to length, 45 degree angles to base boards and architraves, cornices and light pelmets and hundreds of packings for various tasks. A word of caution here... Always ensure that the stock you are sawing is well supported at each side. Don’t put the hand you use to hold the stock against the fence anywhere near the blade. I have read of 2 men who have sawn through their arms ! A quality router will take care of a number of different tasks. At some point, you may want to invest in a router table, as it’s a bit easier to work with. However, you should choose a router that offers variable speeds and at least 2-HP. Remember that the larger cutting bits will require much slower speeds than the smaller ones will. RECONDITIONED. to enjoy the savings I mentioned earlier, you may wish to Save up to 83% with Makita factory reconditioned tools! Good as new they tell me. Or a little less reduction but as they are my favourite woodworking power tools Save up to 65% with Bosch factory reconditioned tools! 30-day money back guarantee and manufacturer's warranty! You can of course buy them new from those 2 links. Carpentry tips and tricks!Here is a link to another website offering Free carpentry help and advice for anyone from DIY novice to established pro. Tool tips, step by step guides career advice and more!